"You're safe with me, Slim." 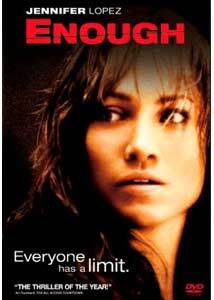 During its theatrical run, I remember seeing the trailer for Enough, and one of my immediate thoughts was, "Wow, Jennifer Lopez looks really hot with short hair." The primary issue, however, was that the trailer lolled out what seemed like all of the salient plot points in such a manner that I felt I had basically seen a shortened version of the movie. It looked to be a flick about domestic violence, whereby meek, short-haired Lopez learns how to fight, in what would likely be an eventual confrontation with her abusive spouse. Despite coming from Michael Apted (The World Is Not Enough, Blink, Gorillas In The Mist, Nell), a director whose work I generally enjoy, even the presence of a locks-cropped Lopez wasn't enough to draw me into the theater. Now, after watching the DVD release of Enough, I have the worthless geek satisfaction of knowing that I was right all along. Lopez is Slim, a waitress at a small L.A. diner who falls head-over-heels in love with a mysterious rich chap named Mitch (Once and Again's Billy Campbell), who defends her honor from the advances of a lecherous customer. After that, in the space of about 15 movie minutes, Slim and Mitch get married, buy a house, and have a baby who suddenly turns into a cute 5-year-old (ah, must be the old time passage montage we all know and love). Slim, Mitch and adorable youngster Gracie (Tessa Allen) are living large, in a spacious home, with fancy cars and all sorts of cool amenities that wealthy folks in movies seem to enjoy. Things suddenly get nasty when Slim discovers that Mitch has been unfaithful, and things then turn even worse when he knocks her around their spacious kitchen a few times, too. Once we find out Campbell's Mitch is a bed-hopping, wife-beating, vile wretch (he's the kind of guy who spouts dictatorial rants like "I make the money, I set the rules") Enough settles in as a fairly predictable thriller of sorts as Slim, with Gracie in tow, spends most of the film on the run from her relentlessly abusive hubby. As the trailer so boldly professed, Slim eventually learns to defend herself (as well as adopting the aforementioned short hair) in yet another montage, this time a Rocky-inspired training one. Enough doesn't have much in the way of dramatic surprises, especially if you've seen the trailer, but it's encased in a snazzy Hollywood wrapper full of endless jump scares, evil henchmen and even Fred Ward as Slim's estranged father Jupiter. Apted, to his credit, gives the film a glossy veneer that somehow makes the material look slicker and more weighty than it is, because if you strip away the occasionally inventive camera shots, you're left with a film that is remarkably simplistic, 20 minutes too long, and much too predictable. Image Transfer Review: Enough contains a 2.40:1 anamorphic widescreen version, as well as 1.33:1 pan & scan, both on the same side of this dual-layered disc. Colors are vivid and balanced well, and image detail is equally strong and sharp. Apted's frequent shadowy night shots are rendered quite well here, with excellent shadow delineation and contrast. The absence of any major compression issues, despite having both transfers crammed onto the same single disc, is certainly worth a mention. Audio Transfer Review: Columbia TriStar's English 5.1 Dolby Digital mix has a handful of moments that really made me sit up and take notice, but by and large the story and its presentation don't lend themselves to much in the way of exceptionally noticeable sound cues. Rears are used sparingly, but effectively, with some particularly neat surround effects used during the film's climax. Dialogue is anchored firmly in the center speaker, with a decent amount of directional imaging spread across the left and right fronts. Also included is a French Dolby Surround 2.0 track. Extras Review: Much like the name of J-Lo's character, the pickings here are slim. All Columbia TriStar has included is a music video for Lopez's ballad, Alive (04m:21s), which is also played over the closing credits. This video alternates between film clips and Lopez in a fake "recording" session setting. The disc also features a theatrical trailer, 28 chapter stops and subtitles in English and French. A review blurb on the DVD cover calls Enough "The Thriller of the Year." That either means it was an incredibly slow year for thrillers, or that this easy-to-foretell tale of spousal abuse redemption is actually substantive entertainment. It's not awful by any means, but if you can't tell exactly how this one is going to end from the very first frame, then you have led a very sheltered movie life.